Best known as the constantly flabbergasted Oliver Douglas in the surreal TV sitcom "Green Acres" (1965-71), the seemingly ageless, allAmerican Albert flew on the circus trapeze and gave song recitals, before settling on acting as a career. Debuting in the military-academy comedy Brother Rat (1938), he immediately won attention with his pleasant manner and effortless comic touch. Under contract to Warner Bros. he costarred in Brother Rat and a Baby, Four Wives (both 1939), A Dispatch From Reuters (1940), Four Mothers and The Wagons Roll at Night (both 1941). After wartime duty, his career was slow to restart, but in the 1950s he found a niche in second leads that enabled him to shift from affable comedic types to heavies and back again. He even snared an Oscar nomination for his supporting role in William Wyler's Roman Holiday (1953). And he was especially effective as the cowardly Army officer in Attack! (1956). Other major credits in that fruitful decade: Carrie (1952), Oklahoma! (as Ali Hakim), I'll Cry Tomorrow (both 1955), The Teahouse of the August Moon (1956), and The Sun Also Rises (1957). Albert's latter-day film roles emphasized his menacing, waspish (and WASP-ish) side, as seen in his memorable performances in The Heartbreak Kid (1972, picking up his second Oscar nomination as Cybill Shepherd's father) and The Longest Yard (1974, as a ruthless prison warden). He's also appeared in his share of exploitation quickies, including The Devil's Rain (1975), a horror flick much beloved of so-bad-it's-good cultists. His latest is The Girl From Mars (1991). 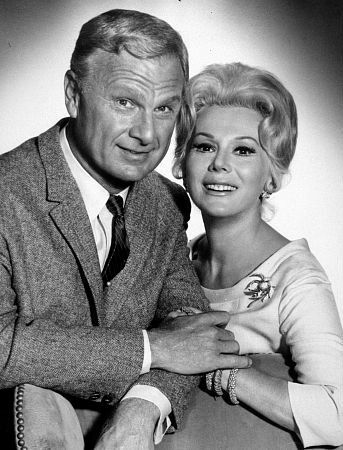 In 1990 he reunited with Eva Gabor for an unmemorable TV reunion movie, Return to Green Acres In the 1950s he was involved in the production of nontheatrical films, and has long been an active crusader for environmental causes. Albert married exotically beautiful actress Margo Lost Horizon, The Leopard Man in 1945; their son Edward Albert (born 1951), a promising leading man in the early 1970s who debuted opposite Goldie Hawn in Butterflies Are Free (1972), still acts in films and on TV.